Throughout Great Britain, London remains to be the center of positive price change. This chart below from Nationwide illustrates the reliability London presents. London in comparison to the rest of the UK remains a strong place to invest, being the only area in the UK with an average annual price change above 15%. “The Rightmove House Price Index.” Rightmove.com. Rightmove, 15 Feb. 2016. Web. 8 Mar. 2016. In general, all of the London area has received positive change. According to the graph below presented by rightmove.com, inner London saw a monthly change of +7.6%, greater London a change of +5.4%, and outer London saw an increase of 3.3%. London demonstrates no signs of decline, with both inner and outer London performing well. 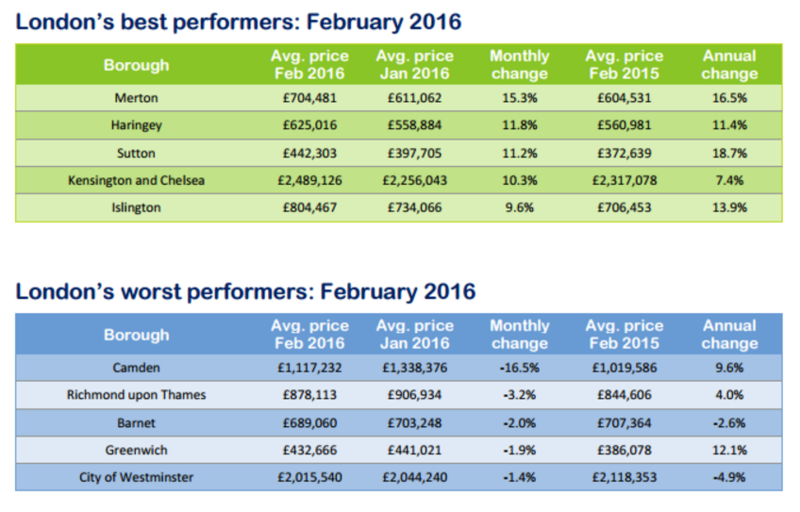 Merton Borough is ranked as London’s best performer for February, with a monthly change almost 4% higher than the next closest Borough of Haringey. Haringey, Sutton, Kensington & Chelsea, and islington all saw strong increases near 10% as well. This shows that although inner London may be thought of as a more stable area, greater London holds many of the top performing areas. Camden is an area that is doing exceptionally poorly, with a decrease of 16.5%. The average price of Camden still remains high at £1,338,376. 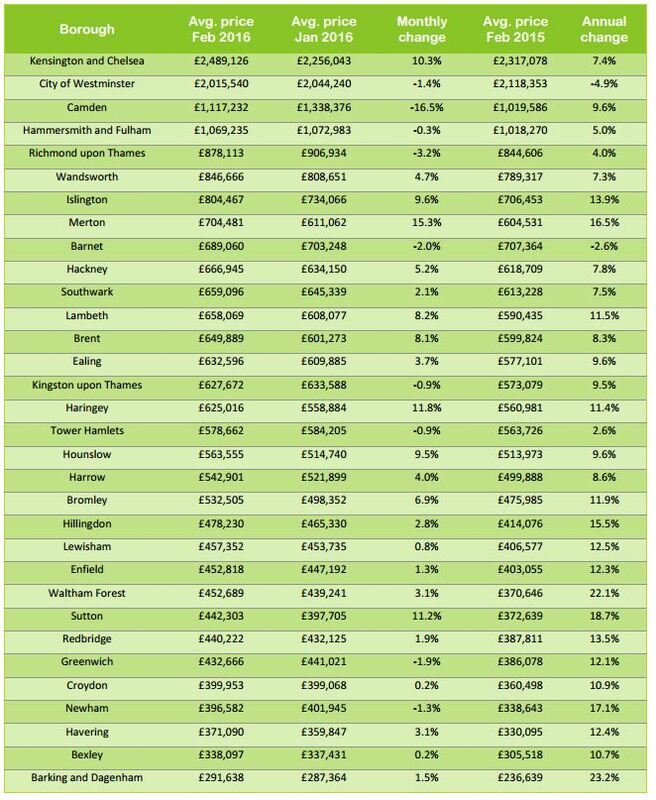 This is shocking in comparison to the other ‘worst performing boroughs’ that only saw decreases below 3.2%. London continues to be an epicenter of business in the UK and London’s strong housing market is evidence to this notion. As greater London increases at a slightly slower rate than inner London, close proximity to the epicenter of the city is shown to increase property value and prosperity. With certain boroughs like Merton and Haringey demonstrating high increases it is evident that success is not solely contained to the epicenter of the city. It is important to notice monthly trends in areas like Camden to understand even the most sought after areas can experience poor performance. Through examining the London housing market from a UK perspective all the way down to specific boroughs, one can better understand the way in which the market has fluctuated this February.